For decades, Honda successfully cultivated a hard-earned reputation for technological innovation and thoughtful engineering, but the Japanese automaker has seemingly grown content to let other automakers lead the way with new technologies in recent years. To this point, Honda has stubbornly resisted the engine-downsizing movement, direct injection, as well as more sophisticated gearboxes and hybrids, instead focusing on refining existing technologies and relying on its lighter weight vehicles to keep their models' performance metrics in the hunt. 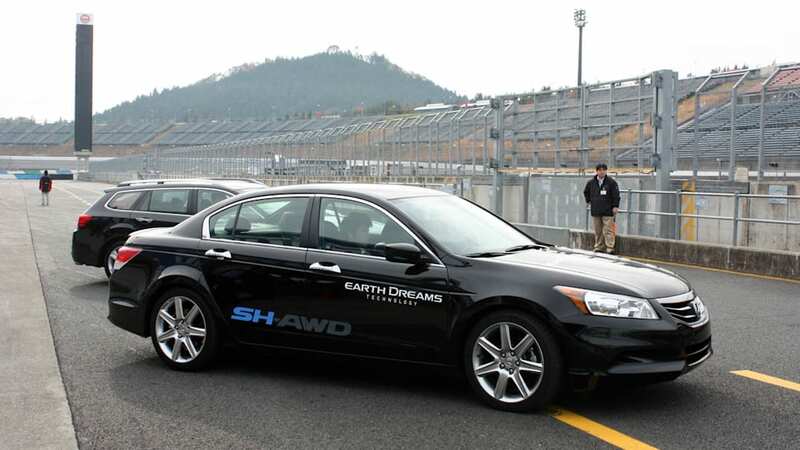 Honda is hard at work on a hybrid evolution of the company's already trick Super Handling All-Wheel Drive system. 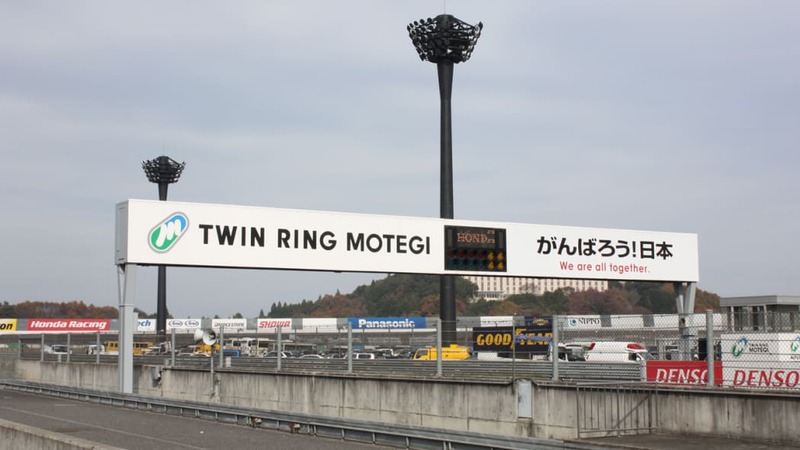 No more, says CEO Takanobu Ito. 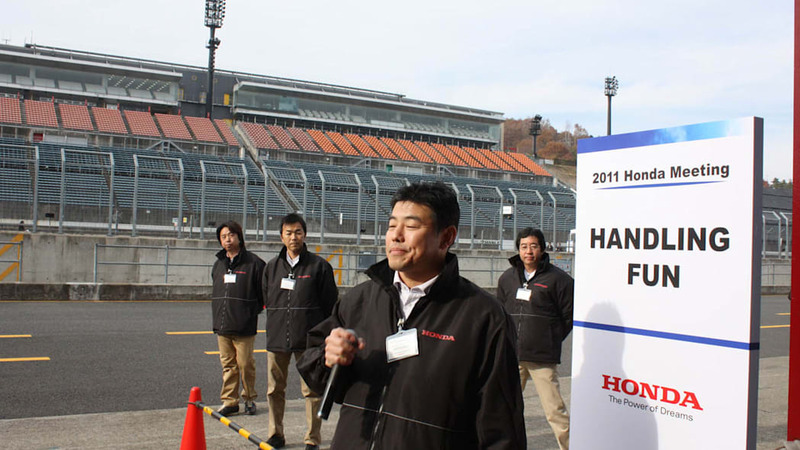 Honda has embarked on a multi-tier technology binge that Ito says will have Honda at the forefront of fuel economy metrics worldwide within three years. On the table? More advanced everything, from the aforementioned powertrain technologies including a new small-displacement diesel and a new CVT, to direct injection and a seven-speed dual-clutch transmission. 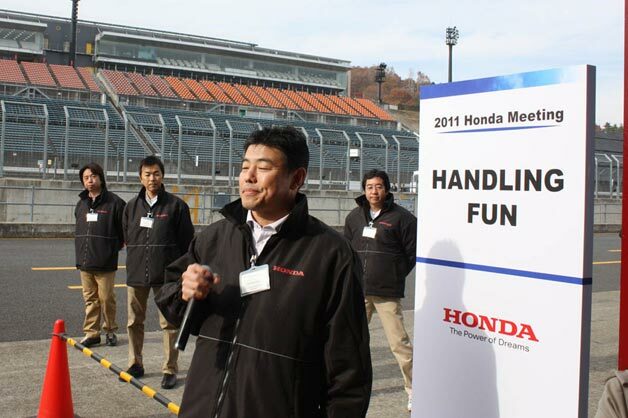 Of course, we've seen similar products brought to market from other automakers already, so excellence in execution will need to be Honda's differentiator. 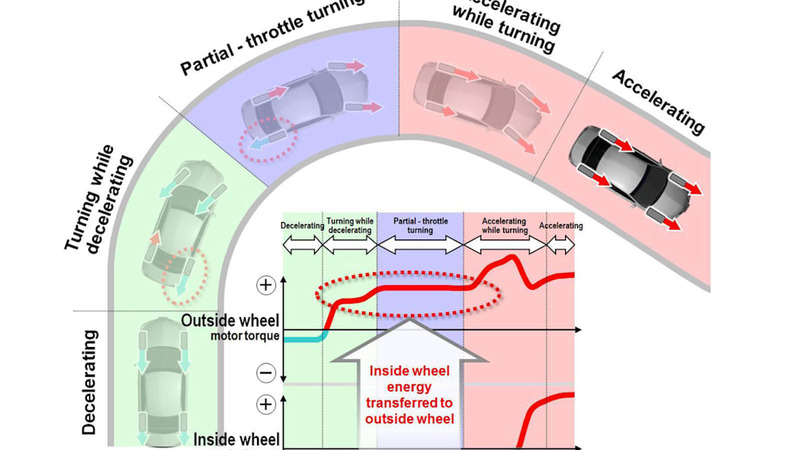 But we tend to expect more innovative thinking from an automaker with such a rich history of elegant engineering, so we were pleased to learn that Soichiro's crew is hard at work on a hybrid evolution of the company's already trick Super Handling All-Wheel Drive serving in vehicles like the Acura TL, RDX and MDX. In addition to the torque-vectoring rear axle already in production, Honda is incubating a new three-motor hybrid AWD architecture that it says will offer V8 power and a more nimble driving experience than typical all-wheel-drive systems, all while delivering four-cylinder fuel economy. 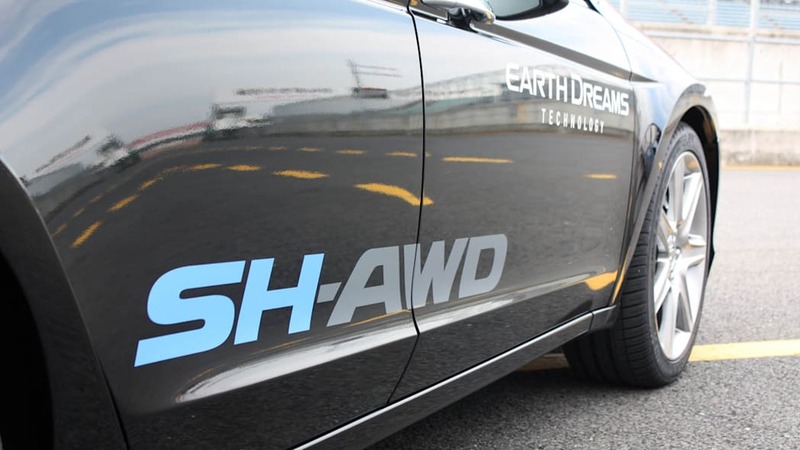 Just ahead of the Tokyo Motor Show, Honda bussed us to its Twin-Ring Motegi racetrack to sample its radical new SH-AWD system in an Accord mule. Despite the plebeian bodywork of this evaluation model, make no mistake, hardware this costly will not debut in something with a Honda badge out front – it will be a technological linchpin for Acura's revival. 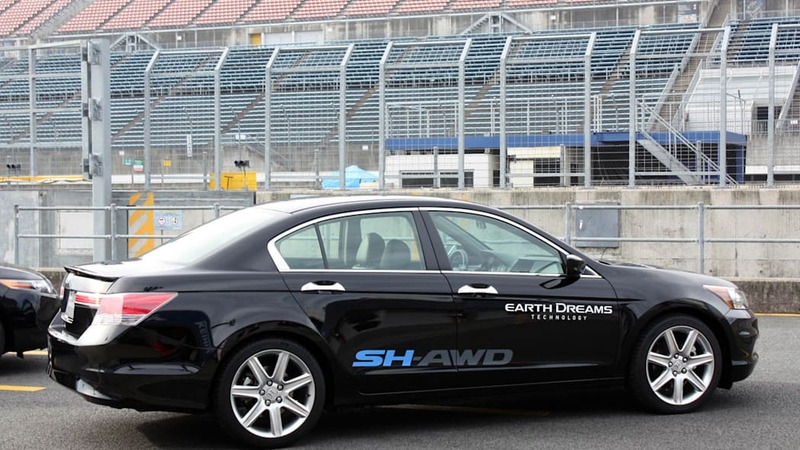 As shown here, this SH-AWD system relies on a direct-injected variant of Honda's 3.5-liter V6, tuned here to deliver 310 horsepower and 265 pound-feet of torque (for comparison's sake, the 3.5-liter six-cylinder in the 2012 Accord manages 271 hp and 254 lb-ft). 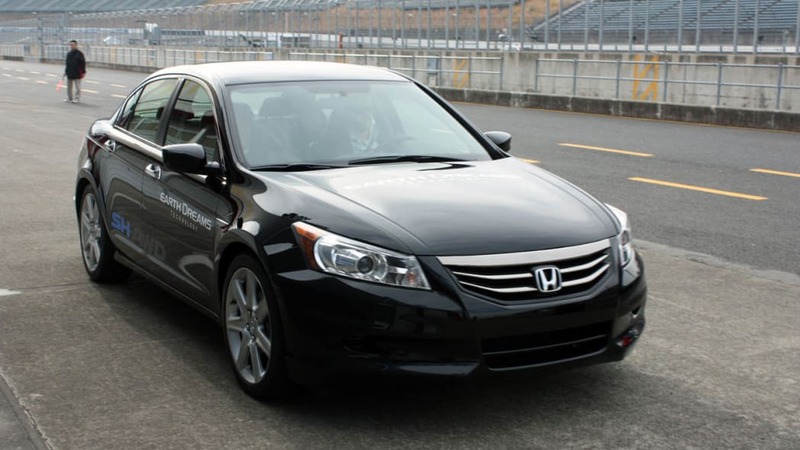 Internal combustion is joined under the hood by a single 40-hp, 96-lb-ft electric motor mated directly to a Honda-developed seven-speed dual-clutch gearbox. Out back, a pair of 27-horsepower, 52-lb-ft electric motors power the rear wheels, providing through-the-road all-wheel drive (read: there's no mechanical connection between the front and rear wheels). 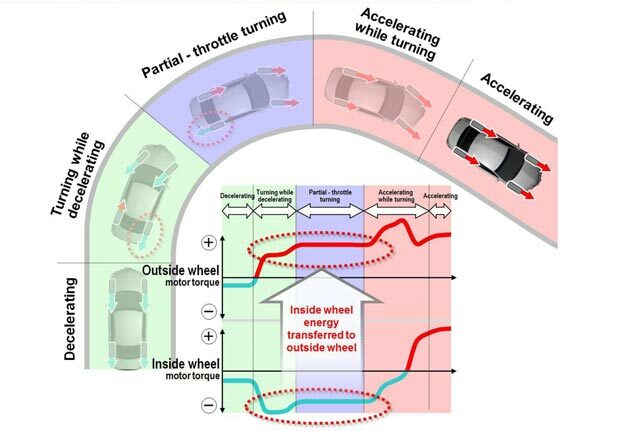 By independently controlling the two motors, either positive or negative torque can be applied to an individual rear wheel, providing torque vectoring in corners while funneling power back into the lithium-ion battery. 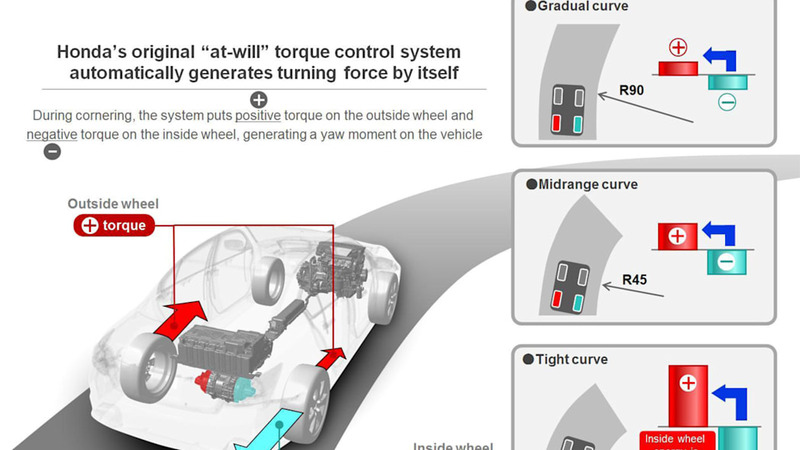 Because the system can simultaneously flow positive torque to the outside wheel and negative torque to the inside wheel in a corner, significantly improved cornering over Honda's current mechanical SH-AWD setup is possible. 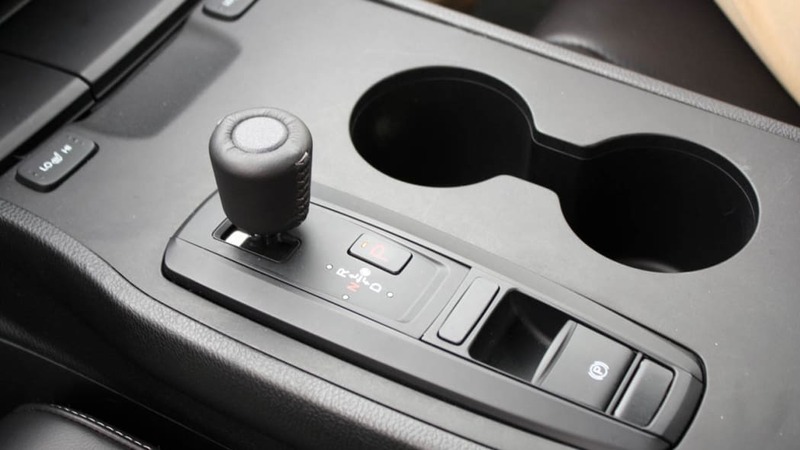 The larger front-mounted motor can also drive the car independently during low-speed maneuvers when the engine is shut off by the start-stop system, as you might want while inching through rush-hour traffic or pulling away from a stoplight. 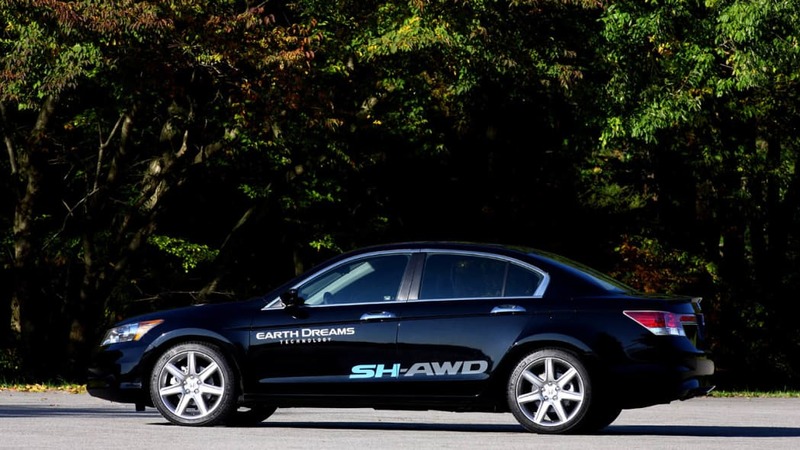 Honda says the car can reach 25 mph running solely on electrons, but as this is a mule, all performance parameters remain subject to change. So how well does it all work? Our time behind the wheel was extremely brief, consisting of little more than one lap of a handling course. Thus, we'll have to withhold judgment, but we will say that the system shows genuine promise. 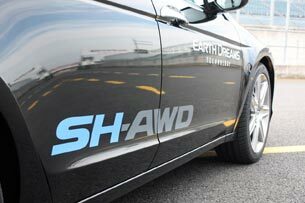 Whirring away from the pits under electric power and having the V6 seamlessly come to life was an encouraging start, but we didn't really get a feel for the SH-AWD until we started negotiating the corners and slalom. While carving through the orange pylons, the sedan felt significantly – and predictably – nimbler than a standard front-drive Accord, displaying genuine eagerness to change direction. In fact, with such brief exposure, it initially felt like the Honda's tail was drifting out a bit, so willing was its rump to rotate. Thankfully, the liveliness was wholly under control, with no drama or tire squealing, just quicker-than-expected turn-in and faithful tracking. While certainly swift, claims of V8 acceleration feel a bit inflated, but given excellent traction and further tuning, such assertions seem possible. 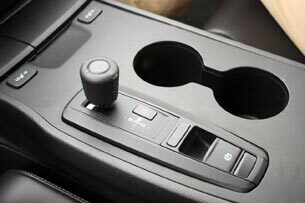 We'd love to give you the full report on how well the Honda's new dual-clutch gearbox works, how heavy the system is, and how fuel efficient the car is out in the real world, but we'll need more wheel time in a production car to do so, and for the moment, officials remain tight-lipped on when this technology will debut. Regardless, it's encouraging to see Honda pushing to regain its powertrain innovation reputation... and to see it investing in Acura.